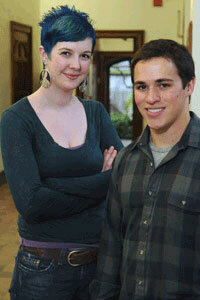 Erin Mowers and Donnie Bungum have won Goldwater scholarships. Two College students are among the 321 national students named Goldwater scholars by the Barry M. Goldwater Scholarship and Excellence in Education Foundation for their outstanding achievements in science. Erin Mowers, a third-year in the College, did not grow up in a science-intensive environment, but said that is exactly where she feels the most at home these days. Mowers hopes her Goldwater scholarship will further solidify a career in science, and she plans to continue her cancer research until her graduation from the College in 2009. She then hopes to enroll in the University’s Medical Scientist Training Program to pursue joint M.D./Ph.D. degrees. In addition to her research at Chicago, Mowers serves as a teaching assistant in two Biology lab classes and also has been a TA for a summer Biology course taken at the University by international high school students. When fellow College third-year Donnie Bungum, a Chemistry and Biological Chemistry double concentrator, first learned about Goldwater scholarship, he knew it was something he wanted to pursue. Bungum said that after hearing stories about the difficulty of Organic Chemistry courses, he read a textbook on the subject during the summer before his second year. For the past two summers and part-time during the school year, Bungum has worked on research in Organometallic Chemistry at Chicago—something he has found humbling. Also at Chicago, Bungum has participated in the P.C. Bio/Beckman Program, an interdisciplinary research seminar for undergraduates studying a range of molecular sciences. During the seminars, students present their research and invite criticism and discussion from the group. “It’s really a place where we learn to think like scientists, and how to conduct ourselves as scientists,” he added, crediting Gregory Hillhouse, Professor in Chemistry and the College, for his development. Bungum said that though he hasn’t decided on the type of Chemistry he will study in the future, he plans to attend graduate school and eventually sponsor his own research group. “I feel so blessed to have gotten my education at Chicago, with professors who are so professional and poised and have a deep understanding of what a science education is. The way they show you how to view science, that is truly a gift. Established by Congress in 1986, Goldwater scholarships are awarded annually to second- and third-year undergraduates who intend to pursue careers in science, mathematics or engineering. The one- or two-year scholarships provide up to $7,500 per school year to fund college expenses, including tuition, books, fees, and room and board.